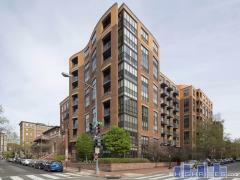 Dupont East is a 9-story high-rise condo building located at 1545 18th St NW on the corner of 18th Stand Q St in the Dupont Circle neighborhood of DC. This condo building was completed in 1960. There are a total of 198 condominium homes at 1545 18th St NW, and the currently available homes for sale are listed below. Have any comments or questions about Dupont East? Ask your question and/or share your thoughts about this Building.